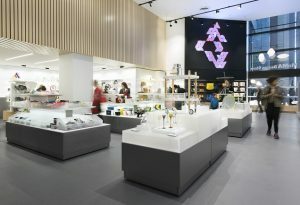 London-based specialist design studio Lumsden Design has been recognised with a German Design Award for the redevelopment of the Museum of Modern Art (MoMA) Design Store in New York City, the first of four major projects the studio is completing for MoMA Retail. The German Design Awards is a prestigious international programme that honours unique trends in design across a wide spectrum of specialisms. Lumsden was awarded in the Excellent Communications Design, Interior Architecture category. 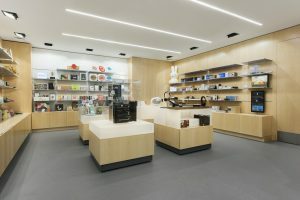 Totalling 250 sq m of double-height space on West 53rd Street, MoMA Design Store has stood directly opposite the Museum of Modern Art for 18 years, offering a wide range of contemporary design-led products. In the first refurbishment since the store opened, Lumsden was tasked to revive MoMA Design Store’s appeal to longstanding consumers and visitors to the museum whilst delivering a more curated and refined approach to the display of its product range. Callum Lumsden, Creative Director, Lumsden Design says: “As the first in a series of four projects we’re working on for MoMA, it’s brilliant to see our redevelopment of MoMA Design Store recognised with such a prestigious award, particularly ahead of the new in-museum store opening later this year. “MoMA Design Store is such an iconic space and loved by New Yorkers and international visitors alike, so it was crucial that we treated its refurbishment with great respect and delivered a dramatically improved space that met the highest design standards.